By using your Khan’s Rewards card you will never leave empty handed. You’ll receive 5 points for every $1 you spend. At 350 points you can redeem a free dessert. At 750 points, you will receive a $10 reward. When you sign up you will receive a Free Shareable or Dessert special offer. Khan’s also offers birthday rewards, the more you visit Genghis the bigger the birthday surprise. Legend has it that during their conquests, Genghis Khan and his men grilled food on their shields over an open flame. In much the same way, our Grill Masters grill your combination of fresh ingredients and stir fry them to perfection on our sizzling hot grill. It’s a centuries-old tradition you can enjoy only at Genghis Grill – the Build Your Own Stir Fry. Genghis Grill, the largest build your own stir-fry chain in the United States, is well known for its fresh, hot and healthy food, and for its style of fun service. Fans head over to the Fresh Market Bar where they are greeted with an array of more than 80 delicious, fresh ingredients from which they can build their own bowl. They then hand their bowl to our grill masters who cook their creation to perfection on a large, sizzling, circular grill. The first Genghis Grill opened in 1998 in Dallas, TX. As of March 2014, there are 105 locations in 23 states nationwide. 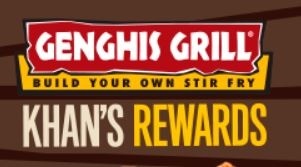 For more information visit the Khan’s Rewards page on the Genghis Grill website.